As the new hunting season gets underway, so too the latest phase of the campaign to persuade the National Trust to stop issuing licences for trail hunting on its land, as reported here. Earlier this year I resigned my membership of the National Trust, a decision driven in part by my helping to foster fox cubs, something which started by accident with an experience that transformed my attitude to Britain’s most persecuted mammal and led to the writing of Orphaned Foxes. It made me reflect how our extreme attitudes to the fox take literary form, characterising him as a gentleman-conman (Beatrix Potter) or enterprising provider (Roald Dahl). But as his wife’s behaviour becomes more and more fox-like, he realises she needs her freedom, and releases her into the woods. After a period of separation – a time of constant anxiety for him, as this was the hunting season – he finds her again and re-establishes the relationship on new terms, becoming a sort of stepfather to her cubs, staying out all night to play with them, helping them to hunt and discovering a kind of animal-happiness he had never before known. But the worry remains about what will become of his new family when the hounds return. Like so much literature of that period – The Wind in the Willows, the stories of Winnie-the-Pooh – the book can be read as an allegory about human life and relationships in which the animal characters are really people dressed up. On this reading, Lady into Fox is about accepting others as they really are and learning from their different ways of being – a choice which can lead to great fulfilment, as this review finds. But I think that Lady into Fox deserves to be read more literally, as a story about a human being confronted by wildness who – rather than seeking to destroy or flee from it – takes from it a (literally) vital lesson about how to live more fully and, well, wildly. 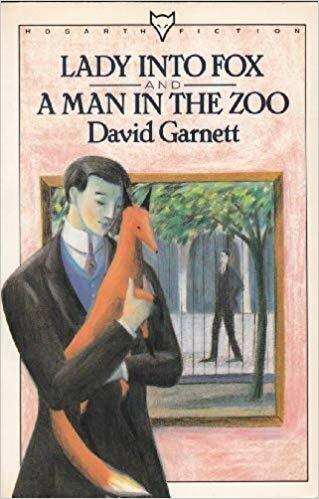 On this reading, the book is a tale about modernity humanity’s relationship with the natural world, one that is prescient about our increasing disconnection with the wild and concomitant yearning to have a closer relationship with the animals with which we share the planet. Like the best allegories, its plot is freighted with a moral and a message – in this case, about the joy that is possible when the human gives up the attempt to dominate the natural world. So why is the fox the star of this particular allegory? For the British, the fox – as the last wild mammal of any size, one of the few predators of our livestock – represents the threat played by the wild in our national psyche like no other animal on this rather tame, industrialised island. In this context, the fox’s growing presence in our cities makes it ripe for a new phase of vilification, as the ultimate urban pest, a despoiler of suburban order and a biter of innocent children. In the country meanwhile, the determination to hunt the fox goes on, despite its variance with the official British value of kindness to animals. This, I suggest, is why the National Trust – that most establishment of institutions and the second-largest landowner in the UK – is failing to face up to its foxism, and continuing to allow trail hunting (potentially a cover for real hunting) on its land. And so, if you read Lady into Fox, as I thoroughly recommend you do, you will see that the threat to his vulpine wife, his other half, his excluded and re-discovered Other – comes not from Mr Tebrick himself, who rises to the challenge, but from the predatory humans who hunt her. And that, sadly, is as relevant as ever.